Yvonne Murray was born in Musselburgh on 4th October 1964 and was to go on to represent Scotland in the Commonwealth Games and Great Britain in the Olympic Game, European and World Championships. 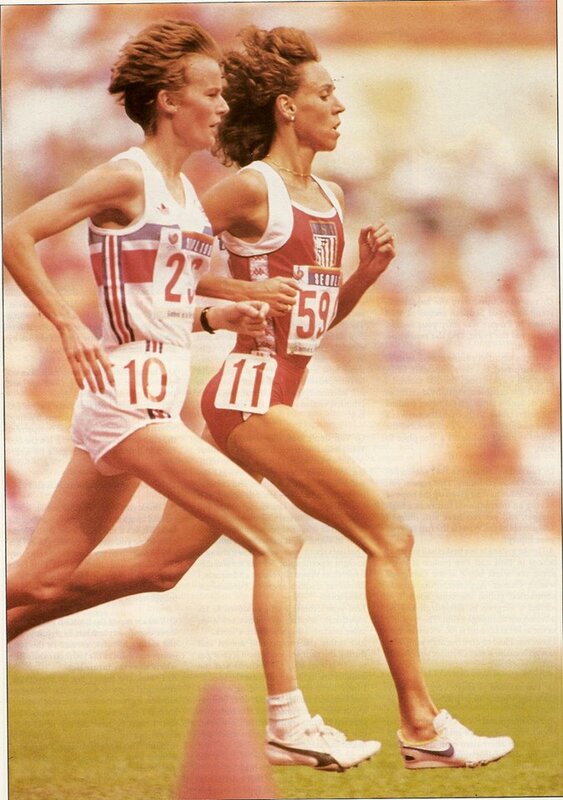 During her time in the sport Scottish women’s endurance running had many very good athletes indeed but there were only two giants – Yvonne and Liz McColgan. Unlike Coe and Ovett in England they did not avoid each other – it was not unknown for Coe or Ovett to turn up at a Grand Prix, find that the other was slated for the same race and ask for a separate race to be organised so that they did not cross swords: there were many meeting where there were separate races at 1500 metres and the mile. The situation did not prevail as far as Murray and McColgan were concerned. The races were hotly contested – I remember one in particular on the roads inside Duthie Park in Aberdeen where they ran so close together that, with no one else within a hundred yards, shoulders were jostled and heels were clipped. But strong as their rivalry was, they both had their eyes on bigger prizes than domestic ones – both went for the Commonwealth Games, the European Games and the big one, the Olympic Games. Where Liz was advised over the years by a range of coaches – notably Harry Bennett, John Mitchell and John Anderson – Yvonne only had two. In the beginning it was Bill Gentleman in Edinburgh and she ran some very good times and won some big medals while with him, and then Tommy Boyle. What difference did the change make? 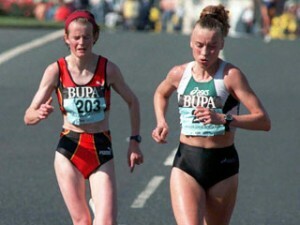 Well to many Yvonne seemed a bit more self assured while with Boyle, she was certainly a harder athlete than before – although she was a delightful personality, when she was running she was a real competitor – and had a broader range of tactics. I have seen her sit in and go over the last couple of hundred metres, I have seen her go from 1000 metres in a 1500 metres race, I’ve seen her go from the front. She was also known to track other runners – Liz and Elana Mayer among them – so closely as to cause them some discomfort mentally as well as physically. This may have come with maturity anyway but that a ‘might-have-been’ and ‘might-have-beens’ do not count. The fact is that she was a talented and redoubtable character who drove herself hard in her quest for success. The following account of Yvonne’s career was written by Colin Youngson. Colin writes: “It must have been 1977 or 1978. I was teaching at Craigmount High School, Edinburgh, and my friend Dave Taylor convinced me to set up a cross country team to take part in the Edinburgh Schools Cross Country League. So one Tuesday afternoon we boarded a minibus and headed off for the distant wind-swept playing fields. Since I was running at least 70 miles per week at the time, no opportunity could be lost to add to the total. My method of ‘coaching’ was to make sure that my boys and girls were warming up, and then to cheer on the leaders in every race by running parallel with them. So it was that I first met Yvonne Murray, who may have been 13 years old. She was the small but extremely determined figure who was inevitably so far ahead of the other girls that they may as well not have bothered. What impressed me was that she was bashing on flat-out right to the finish, when she could have jogged on and still won easily. I praised and encouraged her without having any idea about just how good she would be in the future. His hopes were fulfilled in 1990. Although in the Auckland Commonwealth Games, Yvonne was pipped by one second to the gold by Canada’s Angela Chalmers, she won the WAAA’s title and as Stan Greenberg wrote, ‘At the European Championships in Split she really came into her own with a 600 metre finishing kick to win the gold medal.’ Yvonne Murray was awarded an MBE that year. Ultimately, despite this superb performance (and another victory in the WAAA 3000 metres), Yvonne faded to ninth in the World Championships in Stuttgart. 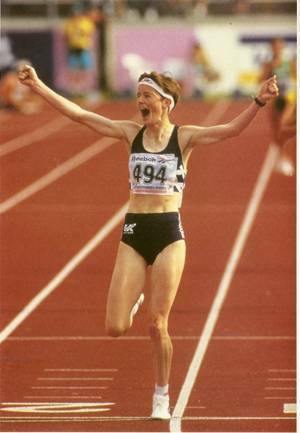 However in typical fashion, she bounced back in 1994 with (in the words of Stan Greenberg) ‘a gallant second place in the European 3000 metres at Helsinki, and then, in only her second run at the distance, ran an outstanding 1000 metres to win the gold at the Commonwealth Games in Victoria. Then to end a wonderful season, she won her second World Cup 3000.’ She was BBC Scotland’s Sports Personality of the Year for 1994. On the few occasions I have met Yvonne since her earliest racing days, I have been impressed, not only by the fact that her international experiences had matured her into a tall confident young lady, but also by her modest, friendly greetings to old acquaintances. Yet I remember watching a needle match between her and Liz McColgan – a 5K international road race in Aberdeen organised by Brendan Foster. Liz tried to run away while Yvonne maintained iron physical control by following so closely that she frequently unsettled Liz by tapping her heels. Naturally Yvonne won the final sprint. She is a lovely person but a ruthless competitor. The account above is fairly comprehensive but a couple of things need to be added. One is an overview of what she won and when and the other is some description of some key races in her career. We’ll go with the overview first in the table below. In addition she had seven Scottish Championships, three AAA’s championships (two at 3000 m and one at 5000m) as well as AAA’s indoor champion. When she was second to Angela Chalmers in the Commonwealth Games in Auckland in 3000 metres one of those behind her was Liz McColgan. ‘The “Independent”s Ken Jones described her first major gold (in Split) with the words “With three and a half laps left she dropped back a stride or two and the others, particularly Yelena Romanova waited for her strategy to unfold. Around again, pad, pad, pad, the pace metronomic and seldom disturbed. When would Murray make her move? Her closest rivals had said they could not tell. A feint to the front as though to get them on edge and then back again into third place. Suddenly she went. Kicking off a bend and towards the bell; a long punishing run for home….. the field was in disarray, stretched out, watching her extend her lead to 15 metres with some 600 left. Had she gone too early? Did Romanova have the energy to catch her? No danger. The girl from Musselburgh went further and further away, uncatchable in the final stretch.” The debt Murray owes to Boyle, said the ‘Athletics Today’ magazine, is enormous. “I was cautious, never prepared to gamble,” she confesses. Murray’s tactics in Split were certainly a gamble. If they had failed or she had misjudged them, Murray may have left the Yugoslavian resort without even a medal.’ If this was a clear triumph for tactics, the 1994 victory in Toronto was another tactical victory – but not one that met with universal approval – at least not Elana Meyer’s! In an interview published in July 1991 Yvonne spoke openly about competition tactics. Athlete’s Input: It is essential that the athlete communicates with the coach and discusses competition tactics, and I felt that this was beneficial for myself and the coach; for the coach checking to see that his athlete was switched on, and for the athlete making me concentrate on what was important – WINNING! Know your opposition: Most athletes keep a check on how other athletes are getting on through televised meetings and running magazines. I find it useful checking up on the new faces also. Evaluate their strengths and weaknesses: I find it useful looking through videos of races, checking on pace, tactics, etc. It is much easier and I can learn quicker about the opposition by watching rather than reading reports on races or by other peoples views, eg Puica is a kicker; I will have to go easy to compensate and try and burn her out early. Plan tactics on strengths to exploit their weaknesses: After finding our opposition’s weaknesses, plan one or two ways of approaching a race and practice in training until feel comfortable about it. Olympics 1988 – thought processes: My own thoughts before the Olympics were ones of confidence. I was the outsider, not expected to get a medal, and I used this as best I could. After planning one or two ways of running the race, I read through the start lists, checking the opposition in a positive manner, knowing the biggest and best field ever, including Samolyenko/Ivan/Decker, etc had been assembled and it was going to be hard but it didn’t frighten me. I then concentrated hard on what I was going to do during the race, no negative thoughts, thinking this was just another race that I wanted to win. I cut down the opposition to two people, Paula Ivan and Tatyana Samolyenko, as the main threats and made sure I knew where they were during the race. I knew that Decker would take it up and hoped she would keep it going knowing that she was not the athlete of old, and at the right point, used my race plan, finishing third, winning a bronze medal, and improving my best for 3000m by nine seconds, but of equal importance the result fully justified my decision to take a much more professional approach and leave no stone unturned in my quest to become the perfect elite 3000m runner. I shall share with you my thoughts on the best tactics to employ to consistently win high level 3000m races. This shall of course be after retiring from international athletics! 25/9/88 Seoul Olympics 1. Tatyana Samolenko (USSR) 8:25.15; 2. Paula Ivan (Rumania) 8:27.15; 3. Yvonne Murray (GB) 8:29:02; 4. Yelenka Romanova (USSR) 8:30.45. 29/8/90 European Championships, Split. 1. Yvonne Murray (GB) 8:8:43.06; 2. Yelena Romanova (USSR) 8:43.68; 3. Roberta Brunet (Italy) 8:46.19. There are several videos of her races at the Youtube website – just type in ‘Yvonne Murray’ and take your pick – unfortunately there is not one of her 10000 CG victory!